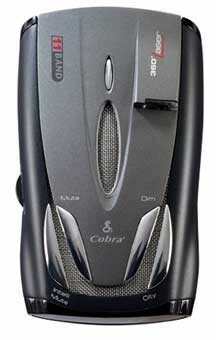 The Cobra XRS-9500 is an 11 bandÂ™ radar detector featuring Cobra's Xtreme Range SuperheterodyneÂ™ Technology. With this new technology, the XRS-9500 has even more range than past Cobra models. This model also provides voice alerts, an alpha-numeric display with signal strength indicator. The intuitive IntelliMuteÂ™ feature is also included, and will automatically mute the detector based on your speed. The Cobra XRS-9500 responds to all types of radar currently in use by police, and provides 360 degree detection of all types of laser guns laser. The XRS-9500 also provides detailed messages from Cobra's exclusive Safety AlertÂ® and Strobe Alert warning systems. The Cobra XRS-9500 is immune to the VG-2 and Spectre I radar detector detectors, and provides alerts when VG-2 and Spectre I are in use.